Bernard Lagacé has long been a North American leader in the revival of the classical organ. His main focus being on music from the Baroque period of which he is a known specialist, he possesses a broad repertory from most musical periods. 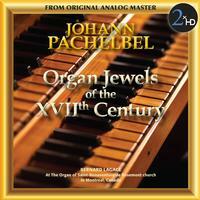 The recording was made on ¼” analogue tape in 1971, using the Karl Wilhelm Baroque organ at the Saint-Bonaventure de Rosemont church in Montreal, Canada. The 2xHD mastering was made from the original master tape, using the original Nagra recorder.